KCCA won the Uganda cup last year after defeating Paidah Black Angels 2-0 in the finals. The Uganda cup this week received a major boost in terms of revenue as banking giants Stanbic Bank and FUFA struck a Shs300 million deal. The oldest tournament will now be called the Stanbic Uganda Cup. This will see the winner of the tournament walk away with Sh30m, the runner up will get Shs20m, the semifinalists with Shs10m each, while the quarter finalists will each receive Shs5m. The Uganda Cup is played annually with teams coming from the league and the non-league across the country. In other news, record league champions SC Villa will play host to Brigh Stars in the round of 32 as the fixtures where announced. Meanwhile 2015 champions Vipers Sc host fellow Premier league side in arguably the biggest fixture of the round. 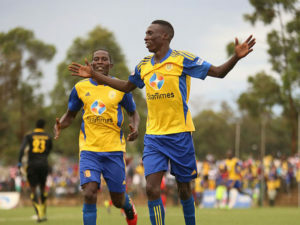 The defending champions KCCA will have a date with Simba of the Big League as Mike Mutebi and his KCCA boys bid to retain the trophy this own last season. Troubled giants Express will travel to Hoima to tussle it out with Kitara FC, the same team that eliminated the Red Eagles from the 2015/16 edition. The 2017/2018 Uganda Cup began in October with preliminary rounds across the eight regions of Kampala, Buganda, Eastern, North Eastern, Northern, West Nile, Kitara and Western.